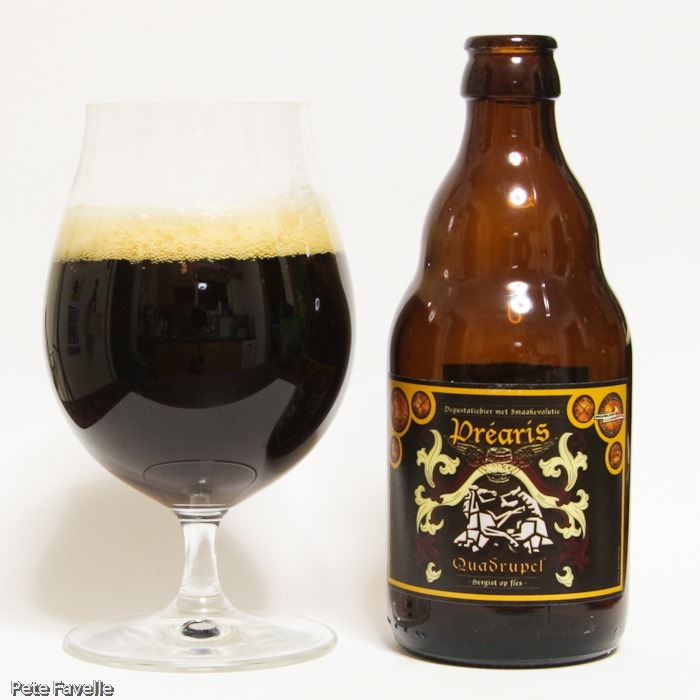 Prearis are living the homebrewer’s dream; after winning a national homebrew competition (“Brouwland Biercompetitie”) with their Quadrupel back in 2011, they turned professional and have been selling their wares ever since. Prearis Quadrupel is the beer that started it all, a big beast at 10% ABV. It’s a near-black beer, with a thin, fine bubbled but lingering head on it. The nose is richly fruity; red cherries and even strawberries, but with a dark sugar syrup background that stops it from becoming too light. Beneath that are some toffee notes, and the warmth of all that alcohol. In the mouth, there are initially lots of foamy bubbles battling with a surprisingly bittersweet black treacle syrup – as the bubbles dissipate, the beer becomes sweeter and stickier, with darker fruits than on the nose; black cherries and prunes. Hints of espresso dance across the tongue. A sharp, almost medicinal bitterness begins to emerge, and then a resinous hoppiness comes through at the end and lingers long after the beer has slipped down the throat. Tasty, complex and dangerously moreish but with a bitterness that’s slightly overblown at the end, this beer earns 3.5 stars.